Raghav accumulated 100 thousand for this week …. [×] [o] Raghavendra: all your repeated words I will remind in every trade. [×] [o] ananth: yeah . thats so true in these kinda markets. [×] [o] ananth: even ill have to change my trading style probably. May 3rd to 4th – watch stocks that make top around this date; 9th to 11th another important date when some stocks will make bottom and other stocks will make top. 22nd to 23rd and 29th to 31st – very important dates for change in trend; watch for stocks that will make top around this date. June 1st to 2nd – quite important; 7th to 10th anther important change; 21st to 23rd a more important change. Nifty is trading in range since last 3 days …global sentiments are not suitable …today is Friday …and Gann turn date also …so sell on rise book gains at low strategy will be gud for intraday traders …. Dhanvarsha Chatroom is here …Admin panel is sharing calls and support there …you can join admin panel if you are genuine , mature and having gud knowledge of market moves . after buy call it was traded below 22 and and above 27…. if some one not traded and not gained ….that is his weakness and not ours…. We wont encourage and accept arguments in future …please noter it . Fears that the Federal Reserve could soon taper its asset-purchasing program caused the Dow Jones Industrial Average to suffer its worst one-day loss in nearly four weeks on Wednesday and curbed risk appetite Asia. Flat to negative opening is expected with extremely volatile session ahead . Getting news that expiry will be @ or above 6200 but mine meter is not moving at or above 6100… in fact we can expect down side…but 6200 ???? looking difficult more and more supply was there …at 6120 level… eod Nifty chart is showing that last candle closed making spinning top …gap filled ..volume was comparatively higher may be new short build up so time to trade with alertness . bank nifty closed making doji at top of whit day …expect one more day of range trade .. It was predicted that nifty may move above 1% on Monday but we have under estimated up move of nifty and bulls also . Daily Nifty chart is showing that nifty moved up more than 1.9% and closed above 1.66% with lower volumes and below pivot level .Few indicators are not supporting up move here.so dilemma will be there and we will see both types of calls in market buy and sell…. trade according to intra day trend ….volatility will be there…. expecting red closing today . Expecting flat to slightly positive opening …initially range trades may be there between 6155 -6185 level later market may trade with larger swings…. we can expect profit booking at higher levels and buying at lows ..
on Sunday night it was shared for Reliance ”buy on dips for 4 to 5 % gain within a week … closed at 785 …tgt 820 plus ” but 1 weeks target fulfilled within 1 day traded above 832 in only 1 session. see nifty futures eod chart traded at 6100 …. save brokerage earn more …are u loosing continuously ? Join dhanvarsha … counselling and you will see the difference . earn and share profit as well as knowledge also . Options will give u fruits only if volatility will increase or market will trade in trend but if range trade will be there do not hold or trade options. Almost flat opening is expected with extremely volatile session ahead expecting range bound trades and or smart pull back of at least 1 % today . it was BTS monday call …. Reliance strikes new, rich vein of gas in KG chal reliance oopar ko !!!! keep stoploss at 758 closing basis add more on dips up to 760 with sl 758 . Trading at lower bollinger … bouncing is possible as falling momentum is not there . wise decision is to go long on this counter ..
news and technical indicators are supporting buy/ bottom fishing . if market pundits are so confident that nifty will move below 5900 then why nifty traded in green zone for more than 5 hours out of 6 hours trade on Friday …..
harami & hammer on support - will shoots up ? Sumit -harami & hammer on support – will shoots up ? kailash: ok to ab kya ? what is bullish harami candle ? A candlestick chart pattern in which a large candlestick is followed by a smaller candlestick whose body is located within the vertical range of the larger body. In terms of candlestick colors, the bullish harami is a downtrend of negative-colored (black) candlesticks engulfing a small positive (white) candlestick, giving a sign of a reversal of the downward trend. Because the bullish harami indicates that the falling trend (bearish trend) may be reversing, it signals that it’s a good time to enter into a long position. The smaller the second (white) candlestick, the more likely the reversal. Do u want to learn online ?? You can learn trading online …chart reading online …prediction online …no need of physical presence …No need to learn at specific time… Choose your time …connect to internet and start learning…you can make easy money and pass your time …you will get full online support from dhanvarsha at affordable prices. Earn money while learning with Dhanvarsha . Are you having courage to trade without stop loss order ? 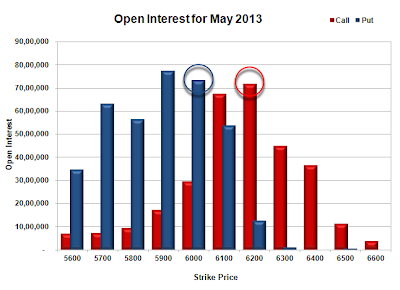 Maruti was giving profit booking signals but blasted up from 1670 to 1777 in last 5 minutes on 24 May 2013.. The CNX Nifty lost 127.45 points, or 2.09 per cent, to close decisively below the psychological 6,000 level, at 5,967.05, while BSE’s Sensex was down 388 points, or 1.93 per cent, to slip below the 20,000 mark, at 19,674.33. Yesterday’s fall, in percentage terms, was the biggest for a day since May 8 last year. EOD nifty chart is showing that nifty is trading at crucial level at 5960 ..we are spotting double bottom …huge volumes may be counted as selling climax also … falling stopped just above 38 % fib retracement… pivot point …falling trend line …1 more uptrend line …we can say cluster support is here …not very easy to break … if these this all is true then no FRY day effect will be there and we will see either range bound trades in 30- 40 points range 5950 6000 range or smooth recovery today…. so wait and watch … stay online at Dhanvarsha chatroom for real time updates , tips and calls and promote it as a healthy platform . Positive opening is expected with extremely volatile session ahead..
nifty was advised to sell at 6165 at dhanvarsha chatroom ..
As expected third crow formation was there at nifty chart yesterday …closed below 6100 psychological level immediate support is available at 6052 then 6037 if both broken then nifty may get support between 5943- 5923 . three black crows accuracy for trend reversal is 78 % as per bullowaski…. 6130 45 will work as stiff resistance. BHEL was advised to sell at 207 last day at chat room Dhanvarsha traded on targets call was . Nifty sell advised with only 2 Rs stop loss at chat room like this gaine almost 60 plus points traded at 6081 target was 6083 .
see stop loss planned for only 2 points . call was at chat room at 9.18 AM within 3 minute of opening. Negative to gap down opening is expected with volatility ahead …bulls are loosing ground and heart …. bears are dominating in scene. sell on rise and book gains at low .Spot te trend and we have spotted why don’t you. Start learning with us …. Join hands with Dhanvarsha …start getting alll Dhanvarsha calls , tips , counselling , morale support , news letters and turn your losing trades into profit making trades only. if third black crow formation will be there spot will trade at or below 6030 today …6114 is crucial point above 6114 bulls and below it bears will dominate. Flat to positive opening is expected with extremely volatile session ahead as both bulls and bears will be busy today to capture 6100 ..
FIIs were net buyers in equities of 680 Cr 0n 21 May 13 . Trade according to levels …all levels projected above are support and resistance levels depend on the last traded price of nifty future .if nifty will trade at 6109 then 6103 will act as support and 6124 will be resistance and we may ask you to buy nifty futures at and above 6103 with sl of 6081 for the tgt 6124. A bearish candlestick pattern that is used to predict the reversal of the current uptrend. This pattern consists of three consecutive long-bodied candlesticks that have closed lower than the previous day with each session’s open occurring within the body of the previous candle. the three black crows pattern is a sign of the bulls’ lack of conviction in the current uptrend. This pattern is used to predict the top of an uptrend, but traders will want to confirm this signal with other technical indicators to confirm that the momentum is actually changing. you may learn analysis at your own time while sitting at home , office or during travel also. No need of any degree only you have to develop curiosity thats all…ladies /housewives are doing better than men in this field as per me .you may get everything at net @ free but what is to be applied and where to be applied can not be learnt without mentor.We are here to assist you …charges are affordable you can earn your fee in 1 or 2 trading sessions. Learn if u want to earn . Join Dhanvarsha online trading / prediction course . A type of candlestick formation where the real body is small despite a wide range of price movement throughout the trading day. This candle is often regarded as neutral and used to signal indecision about the future direction of the underlying asset. If a spinning top formation is found after a prolonged uptrend, it suggests that the bulls are losing interest in the stock and that a reversal may be in the cards. On the other hand, if this formation is found in an defined downtrend, it suggests that the sellers are losing conviction and that a bottom may be forming. A chart pattern that consists of a small white candlestick with short shadows or tails followed by a large black candlestick that eclipses or “engulfs” the small white one. As implied by its name, a bearish engulfing pattern may provide an indication of a future bearish trend. This type of pattern usually accompanies an uptrend in a security, possibly signaling a peak or slowdown in its advancement. 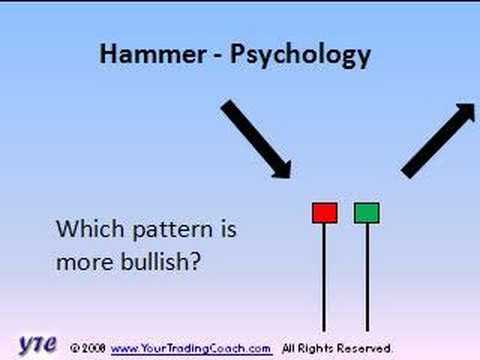 However, whenever a trader analyzes any candlestick pattern, it’s important for him or her, before making any decisions, to consider the prices of the days that precede and follow the formation of the pattern. FIIs were net buyers of 753 Cr on 20 May in eq segment. yesterday silver buy call gained 100% on capital used. moved above 2000 points from days low. and we have asked to buy it . WD Gann “ 22nd to 23rd and 29th to 31st – very important dates for change in trend; watch for stocks that will make top around this date ” so trade wisely . bank nifty advised to sell below 12300.. Positive to gap up opening is expected with possibility of extremely volatile session ahead .6200 at spot is stiff resistance if 6200 will be broken and nifty start trading above it …6200 will start acting as support level and you may go for long keeping stoploss at 6178 …but if failed to retain 6200 then best trade will be go short on futures at 6189 6210 keeping stoploss of 6122 for lower targets . stay at chat room dhanvarsha for real time calls and updates. below that may slip 5911 also . Stay at chat room dhanvarsha for real time market calls and updates. do not trust on past performance watch current performance at chat room dhanvarsha . Share your tips at chat room after obtaining approval from admin. Daily chart ended in dilemma . seeing divergence at chart . 5950 or 6350 both options are open. expect wide range . 5950 to 6350 . BN what is next ?